The availability of arrows in Breath of the Wild can be confusing – and running out of arrows can be a nightmare, especially in the early game! So it’s important to understand the basic mechanism the game uses to ensure a good supply of arrows from the various shops and merchants scattered throughout Hyrule. Each shop or merchant has a predefined number of arrows available in stock, usually some combination of singly or in bunches of 5 or 10. When you first start the game, you don’t have any arrows and all the merchants are fully stocked. The travelling merchant Beedle has a separate stock for each location where he is found, plus there are other merchants you will run across. When a merchant has no arrows in stock, it can be frustrating. If it’s not raining, the lonely arrow lady complains when you walk into the shop that she’s always making arrows – but in fact she isn’t, she only restocks if one specific condition is met. If you have fewer than 50 arrows, the game restocks each shop or merchant location with the predefined number of arrows. The stock of arrows remains with the merchant until sold, no matter how many arrows you subsequently have. How does this rule work in practice? Imagine you have 53 arrows but you use 4 shooting a few fish or apples, or in a battle with a couple of bokos and now have 49 arrows. This triggers the restocking process for all merchants so the next time you visit, each will have a full stock. In total, well over 500 arrows are now available for purchase. The day after you go below 50 (see the weird glitch below), you go to your favourite town and buy their full stock of 30 arrows, so now have 79 arrows. That shop now has no arrows available until the next restocking process is triggered. You go to the next town and buy 10 of their 30 arrows. They now have 20 arrows and you have 89 arrows. You can continue going around as many of the merchants as you like and buying arrows. It doesn’t matter how many arrows you have, once the restocking process has occurred they will have arrows available until you buy them. Then they will never have any more until the next restocking. If you start with 49 arrows and go around all the merchants, you can have well over 600 arrows. You’ll have fewer rupees, however 🙂 You can reach the inventory’s maximum number of arrows (999) by finding arrows in other ways such as in chests or enemy drops. Sometimes a specific merchant location will not restock if you visit just after you go below 50 arrows. No matter how many times you go back, they will not restock. So I recommend that when you go below 50, do not go straight to a town that sells arrows – go somewhere else and sit beside a fire until morning, then go around the merchants. The restocking rule and the glitch also apply to other arrow types such as bomb and elemental arrows. Since bomb arrows are so universally effective and are only available in a few places, it’s best to avoid activating the glitch – stay away from shops until the day after you go below 50! Just east of Eventide island is a small atoll. You can glide down from the shrine on Eventide, or drop the travel medallion (DLC only) on the atoll. In the pool is a chest containing 10 arrows. The chest respawns every time you reload the area – you don’t need to wait until the next day or blood moon. Starting from the Lanayru Wetlands, work your way up the path to Zora’s domain defeating all the enemies as you go. Remember to explore away from the path too for enemy camps. Most enemies in this region drop arrows: you can get well over 100 arrows in one trip and revisit every blood moon. Kilton’s lizal mask is very helpful in these missions! Ancient arrows can only be purchased from the Akkala ancient tech lab. But the rule of 50 does not apply – you can buy ancient arrows at any time provided you have the rupees and ancient parts required. Remember that each ancient arrow also requires a regular arrow as part of the crafting process. 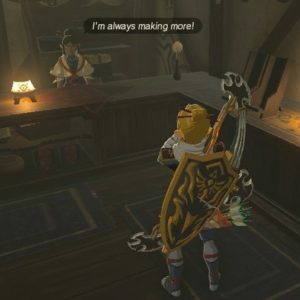 This entry was posted in Breath of the Wild and tagged arrow, Beedle, botw, buy, merchant, shop, store, town on October 30, 2018 by BotWander.